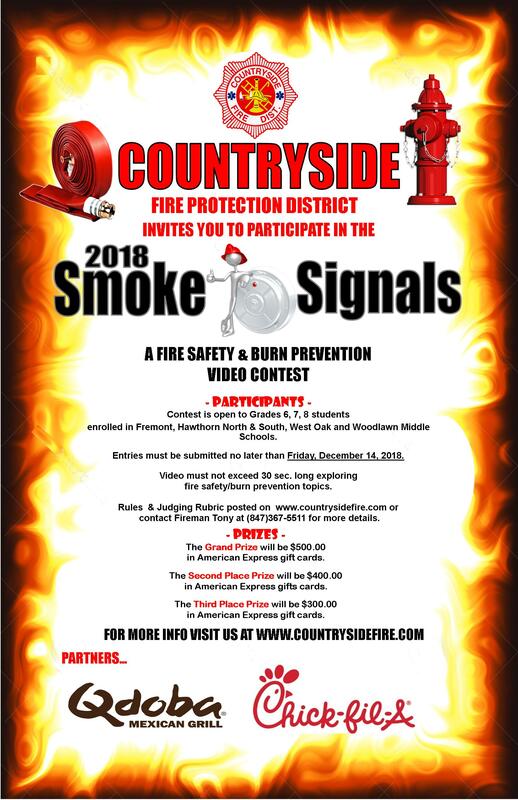 Countryside Fire Protection District is once again sponsoring SMOKE SIGNALS–a Fire Safety & Burn Prevention Video Contest at Fremont, Hawthorn North & South, West Oak and Woodlawn Middle Schools. The entries will be judged based on how well the rules below were met and how informative the video is. Winning videos will be downloaded onto YouTubetm, and a link from our website will direct the public to the uploaded video on YouTube with attribution to the creator(s). The Grand Prize will be $500.00 in American Express gift cards. The Second Place will be $400.00 in American Express gifts cards. The Third Place will be $300.00 in American Express gift cards. Contest is open to Grades 6, 7, and 8th grade students enrolled in Fremont, Hawthorn North & South, West Oak and Woodlawn Middle Schools. Registration forms must be printed and completed by each team member and signed by a school representative. In addition, a participant waiver form must be completed and submitted as well (see forms below). The video must not exceed 30 seconds long exploring fire safety/burn prevention topics. Videos longer than 30 seconds lose points accumulated to win prizes. Videos must also be in a DVD file format such as: .MPEG, .MP4, .FLV and compatible for YouTube. No copyright infringements, music or video. NOTE: Video must not have any personal information in it. Videos will be evaluated according to the rubric provided below. The video should include age appropriate material for a target audience of students in grades 6,7,8. Material should not demonstrate risky or otherwise unsafe behavior. NOTE: There can be no actual fire. All videos should be well researched. We are accepting entries from school-sponsored communications courses or sponsored extra-curricular groups or at large students as long as a school representative is aware and signs the registration. Communications teachers or faculty sponsors must review and approve all storyboards before filming starts. Students are strongly encouraged to contact their local fire department, hospitals and library to help with their research. There can be multiple entries from the same students or class, as students may wish to work in small groups or teams on the project. NOTE: Students on a winning team WILL SHARE the prize! This contest addresses learning standard components 4.B.4a (Grades 6-8) and 3C.4b and 3C.5b (Grades 6-8) of the Illinois English Language Arts “Curriculum Framework and Learning Standard – Contributing to the well-being of one’s school and community. 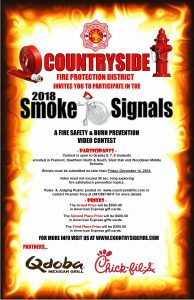 School districts offering communications classes, which include the design and creation of media productions, are encouraged to promote this contest through an independent or group assignment as part of its curriculum delivery. Fire Prevention Week is designed to provide an opportunity for fire and life safety educators to unite in sharing fire safety awareness and prevention messages in our communities. Information about fire prevention and fire safety awareness can be found on the National Fire Protection Association (NFPA) website www.nfpa.org or Campus Firewatch website www.campus-firewatch.com, also www.firesafety.gov.